Do I Really Need Binoculars for Safari? There are plenty of times where you will get close to the animals anyways, but in many cases, you won’t. So binoculars are almost a MUST. 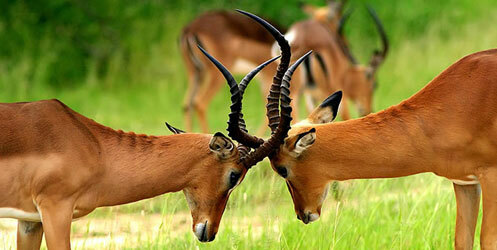 Good safari binoculars definitely enhance your safari experience and allow you to see the animals up and close. Most tours will have one or even two shared pairs of cheap binoculars on board. But these are usually low quality, beaten-up binoculars and not that great for sharing among the passengers. If you want a good view and not miss the right moments because someone else is using the shared pair – it is highly recommended that you bring your own. Do I Need the Highest Quality or Expensive Binoculars for Safari? Certainly not! There is no need to go overboard. Especially if you’ll only be using them once or twice in a lifetime. If you are a dedicated birdwatcher or a regular observer, then check out our birdwatching binoculars guide, otherwise just get a pair of good quality, mid-priced binoculars. What’s the Best Magnification for Safari Binoculars? High magnification is always nice to have. Unfortunately, it is nearly useless for safari! The problem with too much zoom is that your image becomes unstable. There is no space in the safari vehicle for using a tripod so powerful binoculars are not a good option. Another reason is that higher magnification also means a narrower field of view. 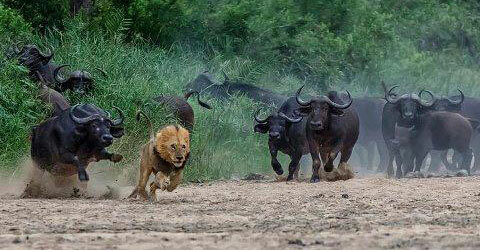 In safari, you will often need to spot animals hiding around large bushy areas. A wide field of view will allow you to achieve that. So, in our opinion, 8x or 10x is the perfect magnification for safari. Any more than that will result in an unstable image. What’s the Best Lens Size for Safari Binoculars? Bigger lenses mean that you can view in lower light conditions. Because you will be out there in the field early mornings and at dusk, you will benefit from 32mm to 42mm lenses. Smaller than that means your image will be too dark at those times. Larger than 42mm means a lot of glass making your binoculars heavier, bulkier and harder to carry, use and stabilise handheld. What’s the Optimal Size and Weight for Safari Binoculars? Obviously, you will be better off with lighter, smaller binoculars for safari. They are just easier to put up to your eyes and spot the action right away. That said, you still need some decent magnification and big enough lenses for viewing in low light conditions. So bottom line: go for mid-sized (8×32 or 10×42) binoculars. These will be the perfect balance between magnification, lens size and weight. What Other Features Should I Look for in Safari Binoculars? Safari means rough roads, high temperatures, frequent movement, dust, humidity and possible drops or hits to your new binoculars. So features like waterproof and shockproof are not a must but are definitely favourable. Another feature to look for is long eye relief. In plain English, this means that you will be able to hold your binoculars further away from your eyes and still see a clear image. This is important if you’ll be using your glasses or sunglasses while using the binoculars. Which Brand and at What Price? We won’t sugarcoat it, with optics you simply get what you pay for. Top notch European brands like Carl Zeiss offer superior image quality and nearly indestructible binoculars. But these can cost you over $2,000 for a 10×42 pair. Cheaper binoculars between $80 and $150 might work as long as there’s always enough light around. Another downside to cheaper models is that they will have blurry, dark or distorted images when using the full magnification. If you want those beautiful views of the magnificent wildlife around you, then mid-range binoculars would be your best bet. Here at Procular, we stock over 400 different binocular models. Our top pick for safari binoculars would have to the Avalon 10×42 PRO HD Binoculars and the higher-end Nikon Prostaff 10×42 Binoculars. They both deliver an extraordinary image quality for their price range and have a wide field of view to capture the wildlife around you. These two models are waterproof, fog-proof, very durable and easy to use. They also work perfectly in low light (early mornings and dusk). For those looking for a more compact option, we also recommend the Avalon 8×32 Mini HD binoculars. They produce sharp, vivid images but are also smaller and lighter. Going on a safari trip but need to travel light? These binoculars are a perfect companion. They are slightly larger than your average pocket size binoculars but much smaller than any standard size binoculars. They offer a perfect balance between small size (32mm lenses), lightweight (416 grams) and excellent quality optics. They fit in a jacket pocket, glove compartment or a small backpack pocket. 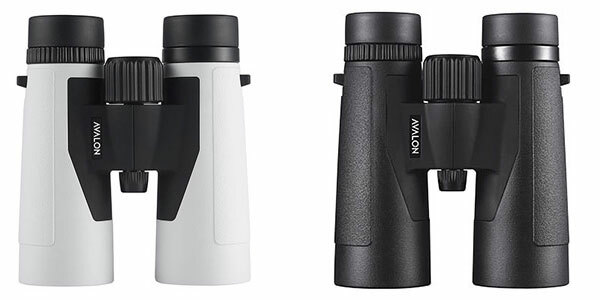 This model combines Avalon’s HD lenses, compact easy to use design and a wide field of view (6.9 degrees) to spot and follow moving wildlife or birds. Just to top things up, the Avalon 8X32 Mini HD Binoculars are also 100% waterproof and fog-proof. They currently sell for only $195 which we believe is a bargain for a product at this level. Available in BLACK or PLATINUM colour. These are Avalon’s best quality binoculars yet offer excellent value for money. The Avalon 10×42 PRO HD Binoculars are available for $249, which puts them in the low to mid-range when it comes to pricing. Considering that they are manufactured with the best optical features, they are a very good choice regarding both price and quality. These binoculars have all the great features to maximise your safari experience including a higher 10x magnification, wide field of view, good weight (550g) and fully multicoated lenses. They are 100% waterproof and fog-proof so can endure rain or humidity. Long eye relief for use with or without glasses on. Their non-slip rubber armouring provides a secure and comfortable grip, as well as added shock-resistance. All in all, if you want to get an affordable pair of quality lightweight binoculars, that are wonderful for safari, then the Avalon 10×42 PRO HD Binoculars are an excellent choice. Available in BLACK or PLATINUM colour. This pair of Nikon binoculars has wonderful optics, multilayer-coated lenses and is very affordable for being Nikon’s high-end range. This is perhaps the main reason why this particular binocular is so popular. The Nikon PROSTAFF 10×42 are superior to most binoculars at this price range in a few ways: They are lighter, more compact and easier to handle for longer periods of time. Image wise, the colours appear more vibrant and sharper thanks to Nikon’s top-end lenses. The Nikon PROSTAFF 10×42 offer a wide field of view; they are waterproof, fog-proof, and highly durable. They provide a clear, bright image even in low light conditions. 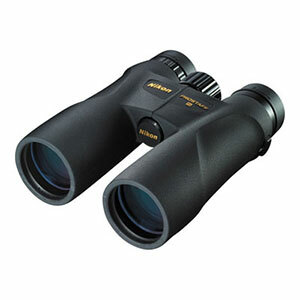 These are the perfect binoculars for safari, bird watching or any type of wildlife observation. Basically they are an all-around high quality pair of binoculars for a very good price. I did go on Safari last October. I took the Nikon Prostaff 10X42 binoculars with me. Quite honestly I did not use them very often. We were so close to the animals and most of the time I was shooting game pictures with my Nikon5300 camera. It has an excellent zoom. I have really bad vision with my keratconous, so I strain to see anything. I am due or another surgery this year after a transplant some years ago. I personally found that my contacts were difficult to wear even with Sunglasses, because of dust when we were on the Jeep safari tours. I wore glasses most of the time and had no problems using the binoculars with my glasses the few times I used them. I am interested in buying the Nikon Prostaff 10 x 42 binoculars for an African safari trip next month. I have a Nikon coolpix s9100 digital camera. What would be the best camera adaptor to use for these products? With binoculars unfortunately there is no such solution out of the box. 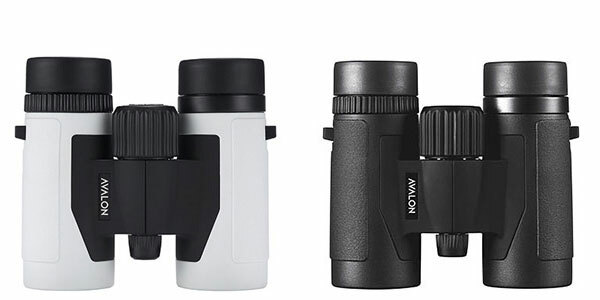 Swarovski have one adapter that connects cameras to their binoculars, but you will be looking at different binoculars by Swarovski and at the $1,500 to $2,500 range. Not too useful for Nikon binoculars and not really worth the investment.. That mentioned, the Nikon Prostaff 10×42 is an ideal choice for Safari, you will just need to manually hold your camera against the lens to take photos. I am going on an African Safari in July. I suffer from quite severe Keratoconus and I am very Short sighted. I have great difficulty in seeing things that others take for granted. Can you recommend binoculars that will enable me to see animals, birds, etc. Please post which binoculars you purchased and how they worked for you. I also have severe keratoconous and I’m going on Safari in October. I am curious to know if you had any success with the binoculars you purchased! Hi Diana – I also have severe keratoconus and am going on safari in Sept. I wonder if you would let me know what binoculars you used and how they worked. Did you wear contact lenses while on safari and when using the binoculars.